The mustache is as much of a statement as any other part of your persona. Using the best mustache wax is the best way to set yourself apart from the crowd. Whether you spell it moustache or mustache, it has permeated American culture and defined some of the most well-known athletes, scientists, politicians, and celebrities. Now whether your mustache is a source of pride or a nuisance in your day-to-day activities, high-quality wax helps you maintain and craft it into the center of attention. Of course, the most functional feature of wax is to just keep the hairs out of your mouth. The thing is, there happens to be a sea of products available these days. It can get a little confusing to say the least. That's why I went out and researched a ton. I found the best waxes and put them in a list of the top 10. In this article, we are going to go over the best of the best. That way you can pick the right one for you and upgrade your mustache game. If you are sporting a full beard with your mustache, then consider using some great beard balm or oil in combination with wax for your stache to make everything look amazing. If you find yourself a little confused on whether to call it mustache vs moustache​, you are not alone. It turns out that the word moustache is the original French version of the word. In English speaking cultures, the word got shortened to just mustache. Of course, both versions work just fine.​ Let's jump into the products next for excellent mustache care. There are several color variations of this wax including brown, chestnut, and neutral. Be sure of what the wax coloring is before purchasing to avoid unwanted coloring after application. This wax is fine to use on sideburns or even eyebrows. It can easily be used on your beard; however, the 0.5 ounce container it will run out quickly. The Clubman wax uses coconut oils and has a subtle but unmistakable scent. It also has food grade preservatives to cut down on skin irritation. If you are looking for a 100% natural product, you might look at other products in this article. 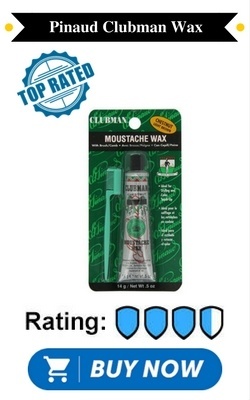 This product goes into your mustache smoothly and evenly and holds it for the entire day. 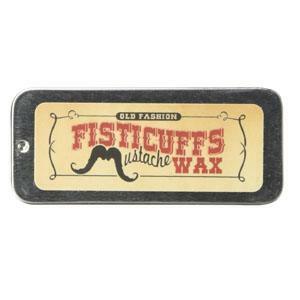 It also comes with an applicator brush, making it the best moustache wax for the money. 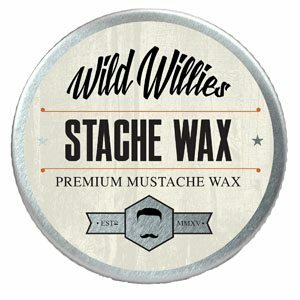 Wild Willie's wax has seven natural ingredients with no chemicals, preservatives, colorants, or fragrances making this a perfect choice for those looking for strictly styling and holding waxes. Not only does this product have incredible crafting power, but it also treats the hair and skin with Shea butter and natural oils. Yellow beeswax and pine resin added to this product create great holding power. You will not have to worry about your stache falling out of place or drooping throughout the day. The wax takes a little time to get to the right application state. 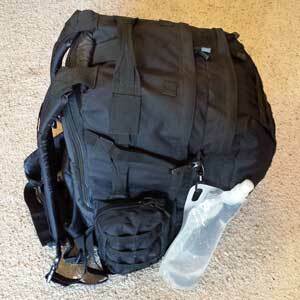 However, it goes on smoothly and removes easily with soap and water. Right off the bat, we are going to tell you that this wax does contain petroleum jelly which a lot of users hate to put on their facial hair. Also added to this item is beeswax, tea tree oil, jojoba oil, and coconut oil. This wax is hand poured and offers excellent crafting power. It does incredibly well when you are trying to craft your mustache into more technical designs. What's great is that it also has a pleasant citrus and rosemary aroma. 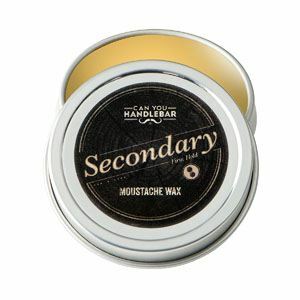 Can You Handlebar wax provides extra strength and a firm hold. It gives you excellent crafting power for unique designs or to just control your stache. No manmade ingredients, dyes, or fragrances are used in this wax. It has an earthy scent to it from the oils, but it fades quickly after application. This wax contains several oils including lanolin, which helps treat itchy, irritated skin. 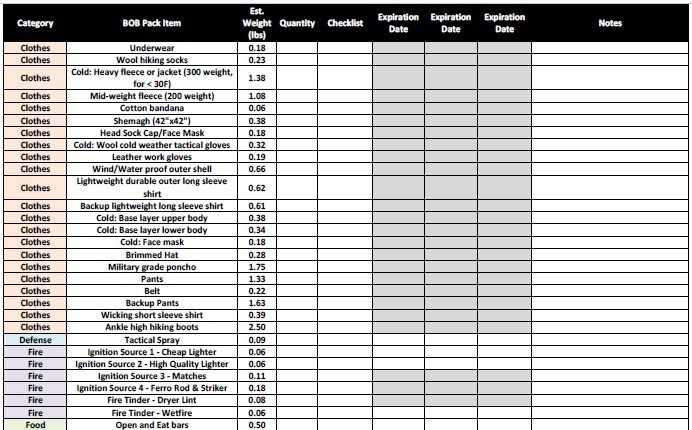 With a purchase, you will get 21 grams—a little more than other products normally provide. Be sure that you have a darker colored mustache before applying this product. For light beards, it causes discoloration. 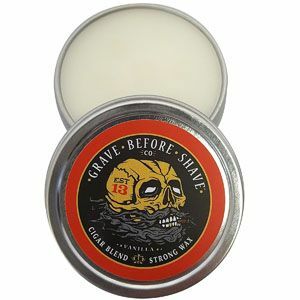 If you have a dark beard, then this is a high-quality stache wax. While this wax provides excellent crafting and holding power, it is also very easy to apply and will go on evenly without clumping when warmed slightly in your hands before application. This wax provides excellent holding power—a big plus for many users. A morning application provides all day holding power. Beeswax is the main crafting and holding ingredient. Other natural oils condition your mustache and skin. This all-natural wax does not contain any artificial dyes or fragrances. It contains beeswax, lanolin, castor oil, coconut oil, and shea butter. 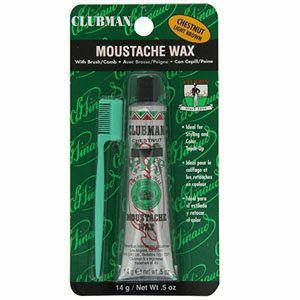 It does not provide long-term holding and crafting power; however, not all mustaches require such a wax. Primary gives a medium holding power perfect for those looking to keep the everyday mustache in line and looking great. Not only this, but the added coconut oil also provides extra conditioning for the hair and skin. This soft wax is extremely easy to apply evenly. You also do not have to worry about this wax causing any hair discoloration. 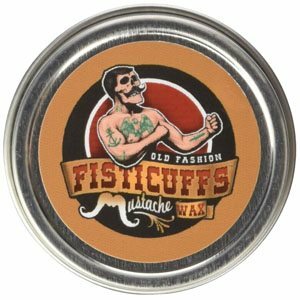 While we have covered the Firehouse moustache wax for those with darker facial hair, this product is suited for lighter hair. 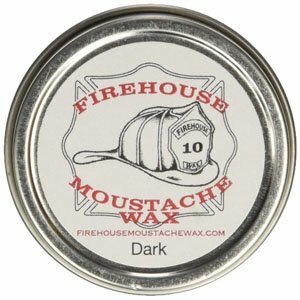 As with the previous Firehouse product, this is a hard wax that provides superior holding and crafting power. This wax keeps your mustache riding where it should be all day through most conditions. 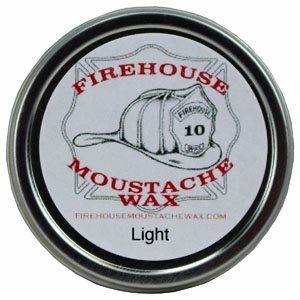 Firehouse is all natural with no added dyes or fragrances. While it does have a slight scent on application, the very pleasant natural aroma fades quickly. It is 100% natural and made right here in the USA. The name of this wax tells the truth! This is one of the strongest holding waxes currently available. This all-natural wax has a very low-key earthy scent when it is first applied. Beeswax is the main ingredient, but the extra crafting power and earthy smell come from the tree resin. There is also Shea butter and several oils that moisturize the hair follicles and skin. When this product is in your stache or beard, it holds continually despite the conditions—rough rain, sleet, snow, or shine. 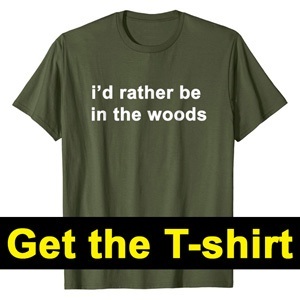 It also performs well in high humidity. 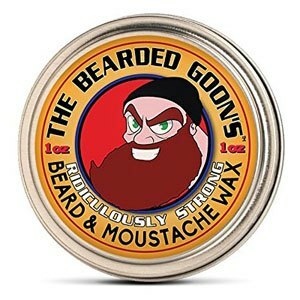 The downside to this strength is that it is a hard wax and takes some extra effort to apply it evenly within your stache. As with the previous Fisticuffs product that we covered earlier in this article, this product, as well as the next, contains petroleum jelly. While it does add a little extra crafting power and helps preserve the ingredients in the wax longer, it keeps this product from being all natural. If you do not care about the all-natural label then what you have is a wax that gives you excellent holding power for the most gravity defying mustache designs for several hours. For the strength it has, it is easy to apply and will go in clearly and evenly without much hassle. It has the more common ingredients including beeswax, pinesap, and several oils that will moisturize and condition your mustache. This wax has a very slight, subtle citrus smell. 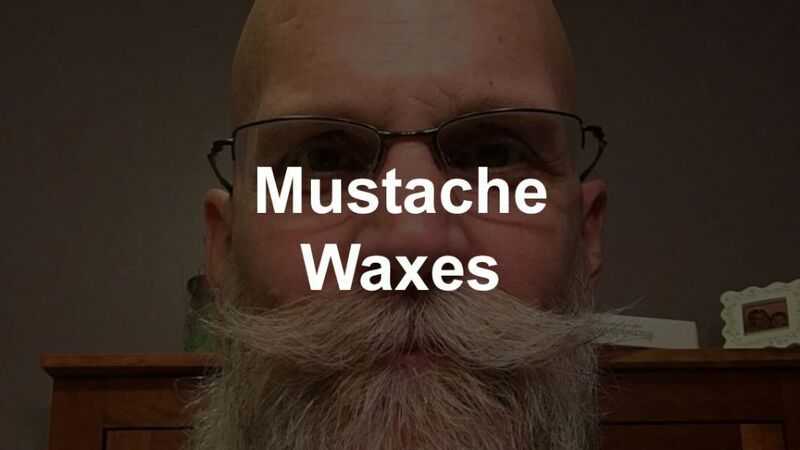 While this wax does provide some decent holding strength, it is not meant to hold up extreme stache designs. It is more about keeping your mustache in line and providing a heavy masculine aroma. It is heavily scented, which is the purpose. As you may have already guessed from the name, the scent is a rich cigar with hints of vanilla. We love the smell, but it all comes down to personal preference. Again, the holding power is more than enough to keep hairs in line or out of your mouth. However, do not expect this wax to hold a handlebar for very long. It is very easy to apply and will go in without clumping up and does not cause hair discoloration.